Have you ever heard of an underground park that receives real sunlight? Well a team of inventors, designers, and strategists have just cleared a key hurdle in bringing the world’s first underground park to New York City, and the project looks amazing. The team utilized solar technology and intends to put a foliage-rich park full of live plants and trees underneath Delancey Street, right in the heart of NYC’s Lower East Side. The designs for this revolutionary park have it calling the 107-year-old Williamsburg Bridge Trolley Terminal home, effectively giving a derelict landmark a renewed lease on life. Kickstarter intends to raise $200k to help fund a test facility it plans to use to convince the City to approve the project. Over the course of the campaign, Lowline officially raised $223,506, allowing them to greenlight production on the testing site. This facility called the Lowline Lab will inhabit a former market building just a short walk from the intended final site, and should serve as the last stop before underground production commences. “Using nearby warehouse space for the test, we plan to install an advanced sunlight collection technology, which is comprised of four different working parts. First, Collectors installed on rooftops track that reflect sunlight down to the street, then Concentrators focus the light towards underground tubes called Irrigators. These tubes then deliver the sunlight further underground to Distributors, which reflect and distribute the full-spectrum light into the Lowline Lab. Using this technology, we have the ability to cultivate thriving plants in a typically dark area, creating a space reminiscent of a city park.” The team said. Digital Trends reports that the project is still in its early stages but the team already produced a small-scale version of the project back in 2012 after another successful Kickstarter campaign. Lowline’s 2012 version featured similar solar technology and successfully created a living, breathing garden fit for people to visit and enjoy. The project in received massive feedback and people loved the project which made Lowline to develop new ideas and relevant technology for the project. 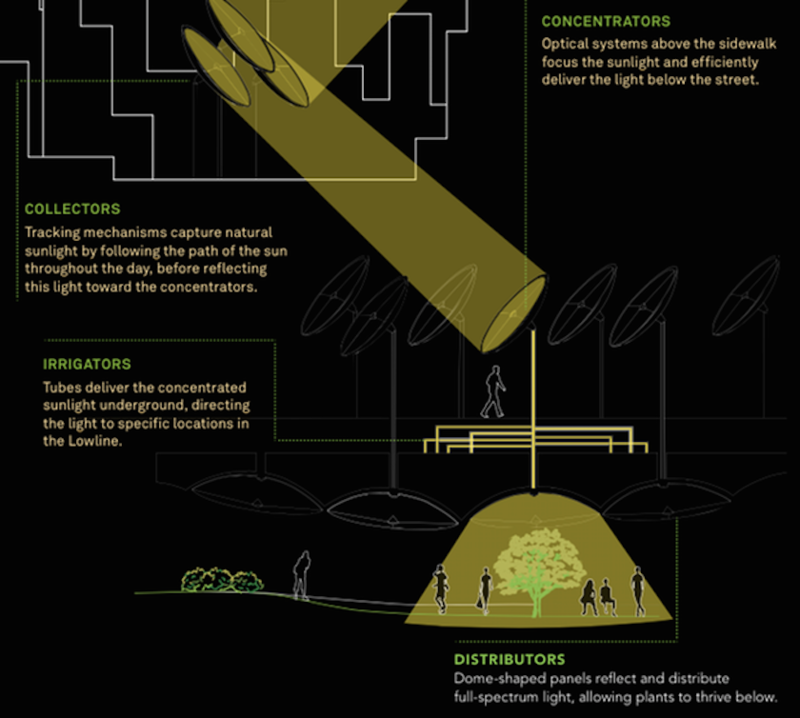 Lowline hopes to see the world’s first solar-powered underground park through to completion because it has great support from directors, advisers and advanced solar technology. The project will be a historic landmark in New York and the world because the solar energy will be appreciated as a natural source of energy. Researchers are trying to make the world a better place by appreciating natural resources like water. Recently we covered stories where a guy made a house using water and another group of engineers surprised many when they developed a computer that uses water droplets.